It came to me on the last day of our long weekend of seeing all kinds of gardens and hanging out with fellow kindred spirits who are passionate gardeners who also like to write and blog about their passions. I was at nearly the last garden when the revelation hit me, though I suspect that the revelation was there the whole time and I just couldn't see it. Or maybe I wasn't ready for it in the other gardens? A seed needs the right conditions to germinate. A revelation needs the right mindset to develop. I should have seen the revelation way up in the mountains Outside Clyde where Christopher, our main Planner Man for fling, and his mother, affectionately referred to as Bulbarella because of all the bulbs she's planted, carve out their gardens in the lush. The revelation was a nice takeaway from the trip. But even without my little revelation, the trip was worthwhile and wonderful because of the many bloggers, now friends, who made the same journey to Asheville. 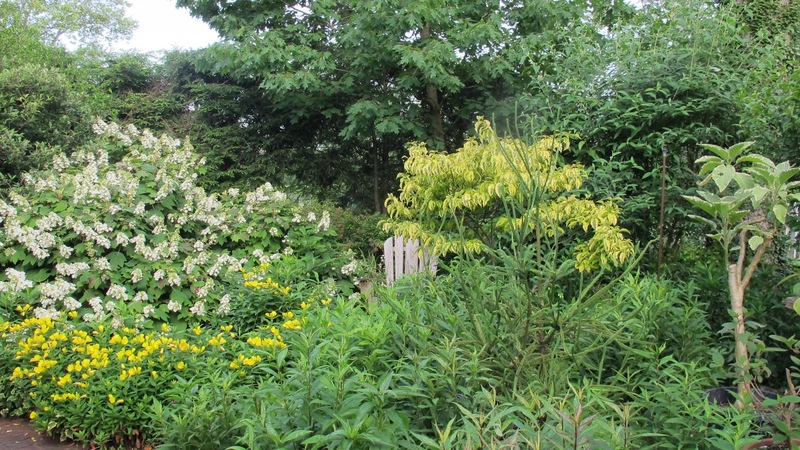 I had my little revelation when I was in the garden of the historic 1889 WhiteGate Inn & Cottage admiring the plants, water features, and focal points. I'm not sure I have a good photograph of the revelation but this picture, with the Oenothera sp., evening primrose, in the lower left hand corner provides a good example as does the picture above high up in the mountains in Bulbarella's lush garden. I have some evening primrose in my garden and was thinking last week that I should contain it a bit because it's a spreader. Then I saw this evening primrose and I realized that I like gardens that are full and lush and cottage-y and that to achieve this style faster in my own garden, I should... oh dare I say it? I should plant some more self-sowing, spreading perennials in my garden. And I should not be so quick to weed them out if when they become a little loose and free amongst the other plants. They can be temporary fill-in plants until other plants are added or grow bigger. Then I can pull out these temporary fill-in plants. Now, mind you, I don't want to go all berserk and plant some wildly spreading bamboo or variegated Bishop's goutweed, but what would be so wrong with adding a few more ox-eye daisies or letting a little clump of evening primrose spread a little further? As I get more plants, I can gradually weed out these fillers. I am aware of the pitfalls, of the disastrous situation I could have in the garden if I don't choose the fillers wisely and edit some of them out eventually. But I think I'm willing to risk it because there are still a lot of blank spots in my garden and I want a fuller, lusher, look. I think this is a lovely idea...just as long as you promise to never ever ever plant Bishop's variegated goutweed...ever. Understand? Yes, the lush was an inspiration. Controlled chaos is most appealing to me too. I think you should go for it. The weavers are indispensable in the garden but editing skills should be ever present. As for variegated goutweed...yes, invasive but I did see a wonderful planting in a area contained on all sides by walkways. No escape. I have some rambling...need to go pull it. I am equally impressed with gardens that are lush and full. I constantly struggle with planting things too close together only having to move something later or having too many open spaces. I think the idea of having some plants that fill in naturally is a great idea. Perhaps looking at native plant options would be a good compromise. Yessss! to spreaders. Very important to any garden design whether naturalistic or formal. Carol, so nice to meet you at the Fling. Great revelation, I like the full lush gardens too. White Gate Inn's garden was full of wonderful blooms, and yes, some were VERY happy and spreading themselves into all vacant spots. I love it. I like the pink primrose, maybe I should embrace it. Super meeting you this weekend. I will be back more often!! So much inspiration to take home from that trip! It was so nice meeting you in person. Oh how I would love to meet up in person with some other bloggers. That must have been such fun! 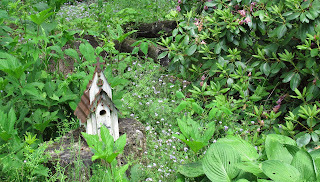 I also have come to that realization, and it is hard to think that when I have such a small garden. Gorgeous photos to show what you mean - I look forward to seeing the results. Get some packages of snapdrgons-or some nice ponypacks-and let them spread. Or will they in Indiana? In a customer's garden in Idaho-there is some protection from a stonewall-they are spreading almost wildly. Try california poppies and remember that foxgloves self seed. So will violas. I would recommend violets but they do want to take over and their blooming season is too short. I feel that if you love a plant, it is fine to let it grow wherever it wants. Here's another idea - a couple years back my mother-in-law gave me a few little panola plants; combination of viola and pansy. It was gorgeous in one of the raised beds, but got kind of big and we needed the space for vegetables so we pulled it out. And this year, those cheery little faces have come up in the walkway between the beds. It is perfect. No weeds and lots of color. Lush and full is gorgeous, though harder to pull off the farther west you go (until you get to the West Coast, damn them). Still, I have some nearly untamed spreaders in my garden, like purple heart, that give it a lush vibe. It's good to have them especially when the garden is young. 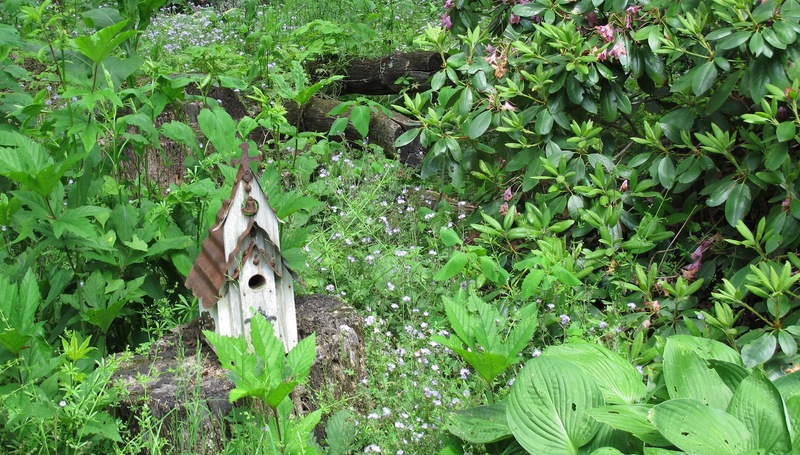 I think we all came away with inspiration from Asheville--my revelation was that a garden can be anything you want it to be and any style you want. So nice to meet up with you again, Carol!